Well, my loud shirters, it’s time to bid you all a sad fur-well. My days of dog-blogging are buried! It’s been fun sharing a tail or two with you and I’ve loved seeing all your Loud Shirt Day fun! A big round of ap-paws to you all for your incredible fundraising efforts although I don’t think I can quite rest yet as I’ll be counting the money as it comes in. The children around here are going to be sooo super excited at all the paw-some sup-pawt you’ve given them. Thank you so much for being involved and getting LOUD! We are fur-ever truly grateful. I want to thank our friends at DOGUE for lending me some super LOUD outfits. It’s time to take my wardrobe off to the laundro-mutt. I’m off to bury the bone now. Fur-well my friends until next Loud Shirt Day! Friday, October 21 2016 – It’s LOUD SHIRT DAY – Hip hip hooray! Well dog-gone it! Today is the day. It’s LOUD SHIRT DAY and time to get loud for a cause. I’ve been a little stuck here blogging away to organise my own event but I know you’re all out there getting loud and I am fur-ever grateful. 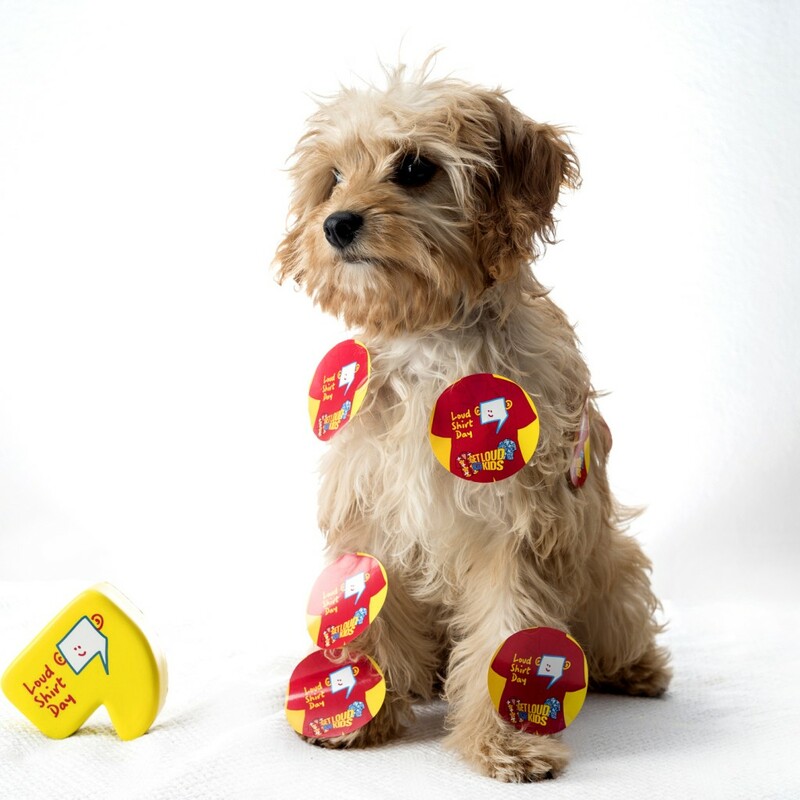 For pet’s sake, who went and stuck all these stickers on me? I may have a bone to pick with you. Getting these off is going to be ruff that’s for sure! As soon as these stickers are off, this little hot dog is out to play! I think with all my paws-ting and lending a paw around The Shepherd Centre mailroom, I’m due for a howl-iday. I’d love to see your Loud Shirt Day pics so why not post them on our Facebook page? I woof you all my loud shirters! Well, today has been a little ‘ruff’. All this work paws-ting out loud shirts to our sup-paw-ters and fellow dog-bloggers has left me a bit weary. It’s a bit of a dog’s breakfast in here but whatev-fur, it’s all for an incredible cause. We are hoping to raise more than $100,000 through our Loud Shirt Day and we need YOUR help! All money raised goes towards helping children with hearing loss learn to listen and speak. But that’s not all, The Shepherd Centre goes above and beyond to also offer support for families through regular counselling sessions, social skills programs for children and school readiness program. They really have everything under the one roof here – it’s paw-some! But they can’t do it without you so jump on board today at www.loudshirtday.com.au. It’s time to un-leash your LOUD!!! 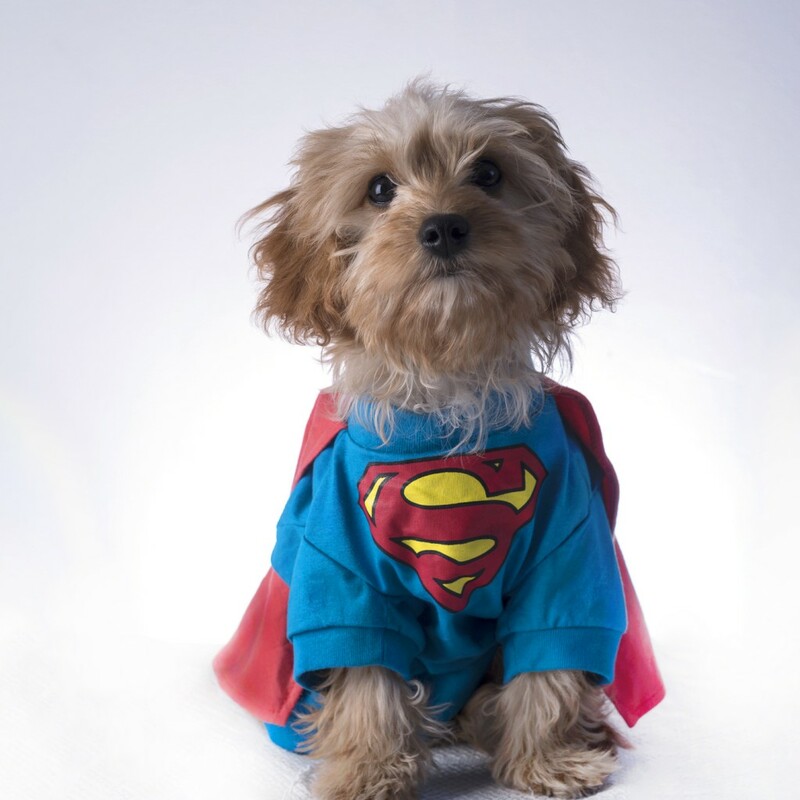 Did you know that you, my fur-tastic friends, are my super heroes? Across Australia the National Disability Insurance Scheme (NDIS) is rolling out and, in many areas, has already rolled out. While we welcome this as a paws-itively great move for the disability sector, we still des-paw-rately need more funds. The NDIS does not cover all of our costs and so The Shepherd Centre relies heavily on their fabulously paw-some fundraisers and donors to help them continue to achieve the amazing results they do. Over 85% of my little human friends with hearing loss at The Shepherd Centre go on to achieve the same spoken language as their typical hearing peers. That certainly deserves a round of appaws! So, you can see that I’m ‘super’ keen to sup-pawt my friends at The Shepherd Centre by going LOUD. Together we have the pet-tential to make an incredible difference to so many children’s lives. I’m begging you to jump on board to get LOUD with me! Loud Shirt Day is on Friday 21st October however you don’t have to do something on the exact day. So why not get started today? Us puppies love playtime and so do my human kid friends. Did you know The Shepherd Centre uses play-based therapy to teach children with hearing loss how to listen and speak? It’s loads of fun and educational too. The Shepherd Centre’s amazing Listening and Spoken Language Specialists spend a minimum of seven years (and in some cases up to TEN years – that’s 70 dog years) studying and undertaking on the job training to become certified. That’s dedication! They are seriously paws-ionate people! Today I thought I’d don my Dogue outfit to colour-coordinate with my playtime. I think I look quite ‘fetching’ and I’m ready to play in this warmer weather. 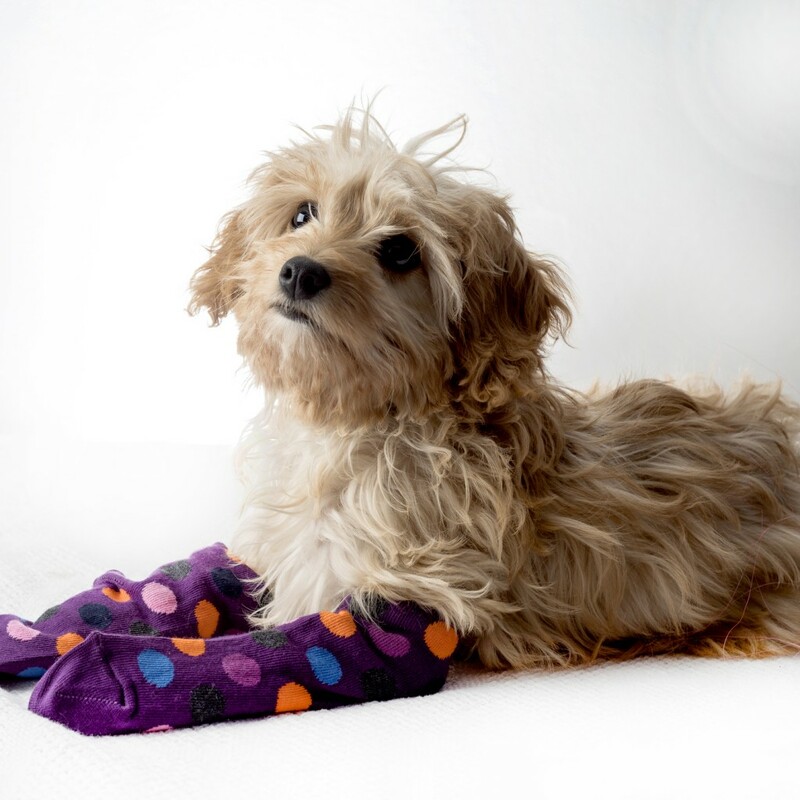 Now that we’re well in to Spring time, it’s a paw-fect time to be pulling out your brightest threads and getting LOUD with me for a cause. Don’t fur-get to sign up with me to help children with hearing loss. The more sup-pawt we get, the more money we can raise. 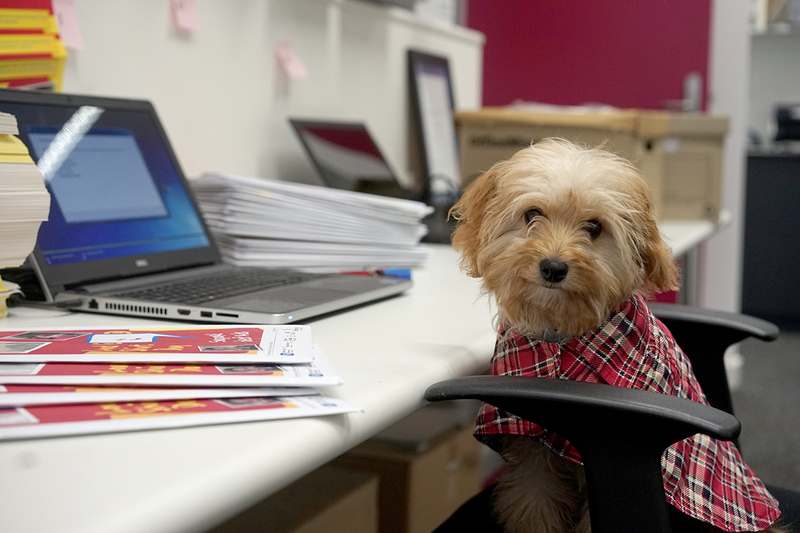 It’s a great way to get pet-working with your pals at work too. Register for Loud Shirt Day today at www.loudshirtday.com.au. So, I pop my head in to The Shepherd Centre today and decide that I’d lend a paw with all this wonderful work going on around Loud Shirt Day. 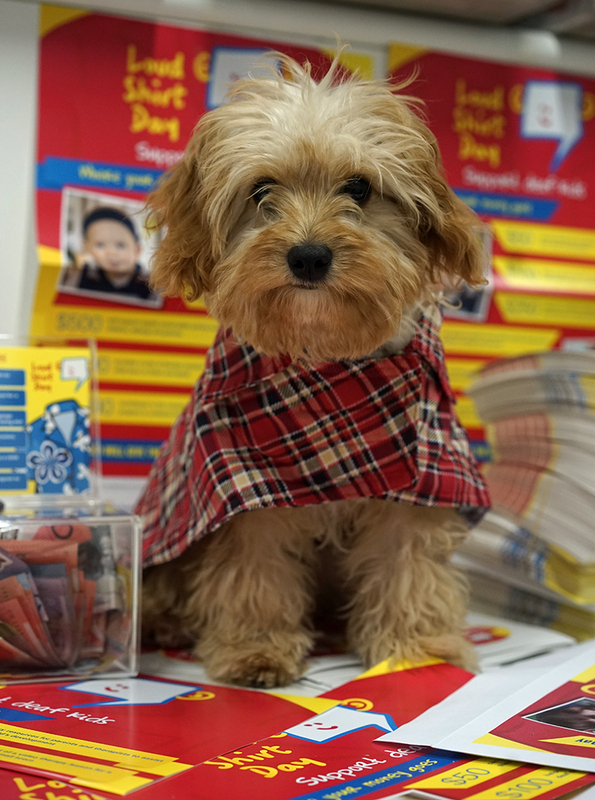 They’re so busy with registrations for fundraising that I thought I’d help by paws-ting out all these fundraising packs to our wonderful supporters. It’s going mutts in here! If you’re thinking of getting involved, it’s paws-itively super fun to do and so easy. 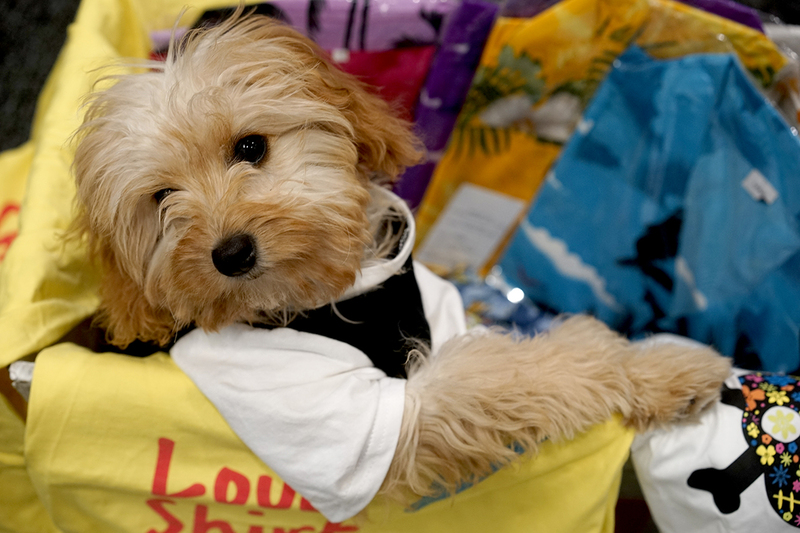 Register at www.loudshirtday.com.au and I’ll paws-onally sign, seal (with a lick!) and, OK, maybe not deliver but I’ll definitely pop your fundraising pack in the post for you to get started. I’ve been searching through the registrations and there are some great fundraising ideas there. We’ve got people hosting fashion parades (hold the puparazzi, did someone call Vanity Fur? ), bake offs (oh, Bone Appetit! ), morning teas, Bark-B-Q’s, best dressed competition, worst dressed competitions (mind the fur-paws!) and so much more. 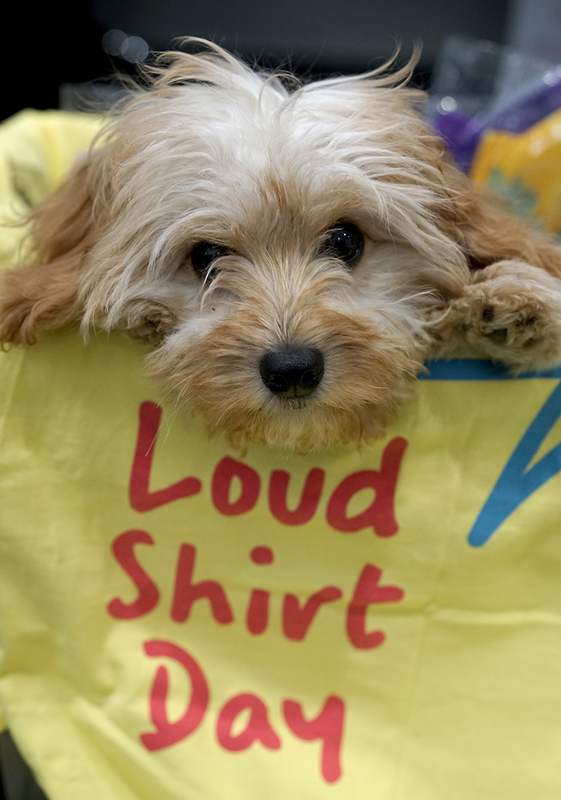 So time to get pet-working, what have you got planned with your buddies for Loud Shirt Day on October 21st? Can’t wait to see your registration come by my desk! Last week I may have gone a little OTT with my Hawaii-5-0 get-up so, this week, I want to show you that you don’t have to be a complete extrovert to participate in Loud Shirt Day. Sometimes it’s the subtle touches that can make your LOUD outfit so special like my super cute spotty socks in this picture. So why not paws for thought and think about how you CAN get involved. Try some LOUD socks, a tie or hair accessories. 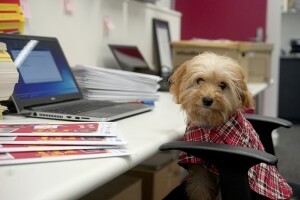 Or if you’re not in to dressing up yourself, you can also dress up your workplace or your pooch instead. Loud Shirt Day is such an important cause. Did you know that hearing loss is the most common disability amongst children in the western world and that one in every 1,000 Australian babies is born deaf? Those figures are barking mad! Organisations like The Shepherd Centre help hundreds of children with hearing loss learn to listen and speak. But early intervention comes at a cost and, well, frankly, they need your sup-pawt. Fur-tunately, you can help! Register for Loud Shirt Day at www.loudshirtday.com.au. Well Aloha my pals! If Magnum PI can get away with it so can I! According to a recent NY Post article, the once considered ‘humorous, garish or tacky’ Hawaiian shirt is now uber-cool. Paw-sonally, I’m a little offended by this description but I’m not going to terrier myself up about it. #Whatevfur!! So, for this post, I might have overdone the theme just a tad, but I’m no lei-about – I’m serious about this fundraising for a cause. 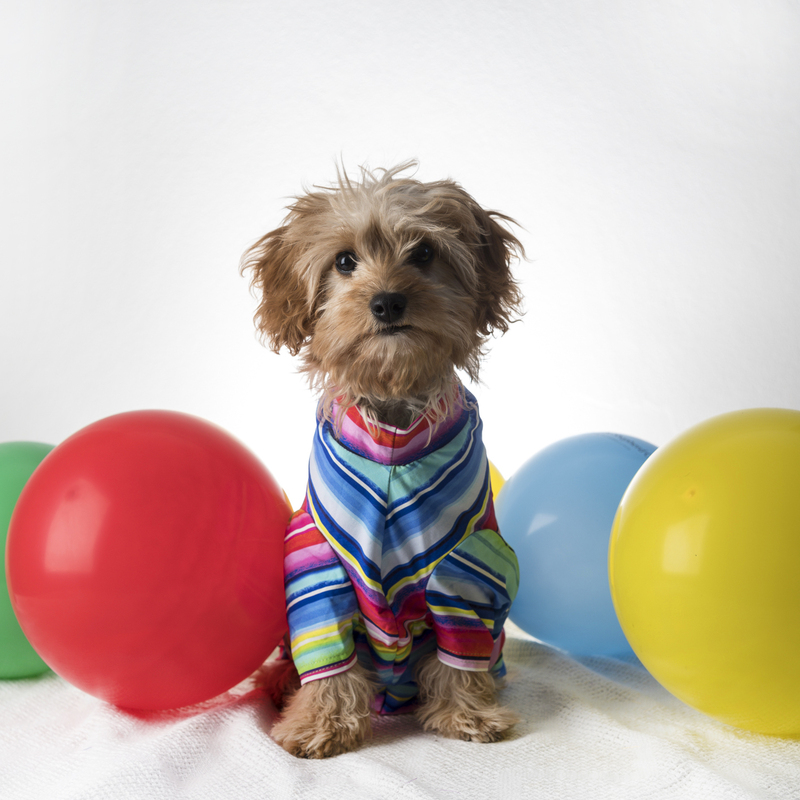 Loud Shirt Day is the best fun a pooch can have so why not join me and get fashionable for a cause? Get your friends together or colleagues at work and dust off the tropical threads, then register at www.loudshirtday.com.au. Well hi again to all my pawsome friends out there! I want to introduce you to my pawsitively ins-paw-rational fur-pal, Ruff. Yes, Ruff is my senior and he has hearing loss and is also vision impaired. So, I try my dog-gone hardest to help Ruff out and he also teaches this new kid on the block, a trick or two (OK, so sometimes a little treat doesn’t go astray!). I can see for Ruff the challenges he faces with hearing loss. He hasn’t been able to hear our owner call his name or tell him to fetch things. It makes it tough for him but it’s been an eye-opener for me to understand more about the effects of hearing loss in the everyday world. So, I decided to do something about it and for the next couple of months, I’m going to dress up LOUD to try to raise awareness and money for my human pals out there with hearing loss – especially the little guys like me. It’s so easy, I just pull out my finest threads and will try my best not to commit a fashion furpaw – but hey, it’s LOUD SHIRT DAY – and well, furpaws don’t really matter that much! 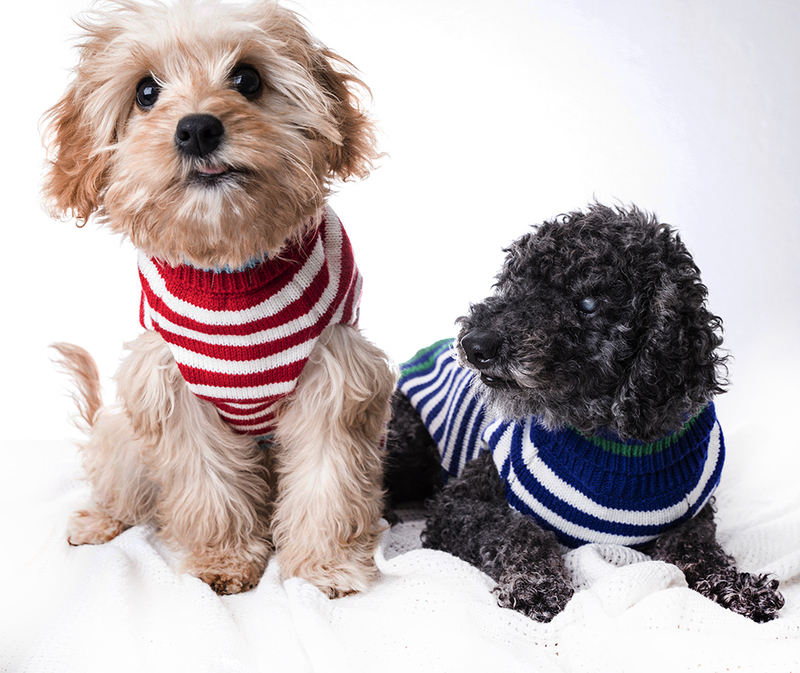 So here’s Ruff and I in our matching DOGUE sweaters. Surely it’s im-paw-sible for you not to give us a helping paw? Sign up to help us get loud and proud for a cause. It’s fun and simple! Hello friends! Well, it’s National Dog Day and I’m putting a shout out to all my canine pals on this special day. Who’d have thought that someone would be thinking of little ol’ me on this special day? I just received this super package in today’s post and I can’t wait to see what’s inside. I have a friend of mine who has hearing loss and I’ll be supporting him and many others with hearing loss by getting LOUD in October. No, that doesn’t mean I’ll be driving my neighbours barking mad with my big scary woofs, but I’ll be dressing as loud as I can to stir up a bit of attention for my friends out there with hearing loss. My super paw-some friends at Dogue are giving me a bit of a hand and I can’t wait to see what’s in the box. Make no bones about it, I’m going to be loud and proud! I hope you follow my Loud Shirt Day journey over the coming weeks and give me a bit of suppawt by signing up here to help raise money for our friends. 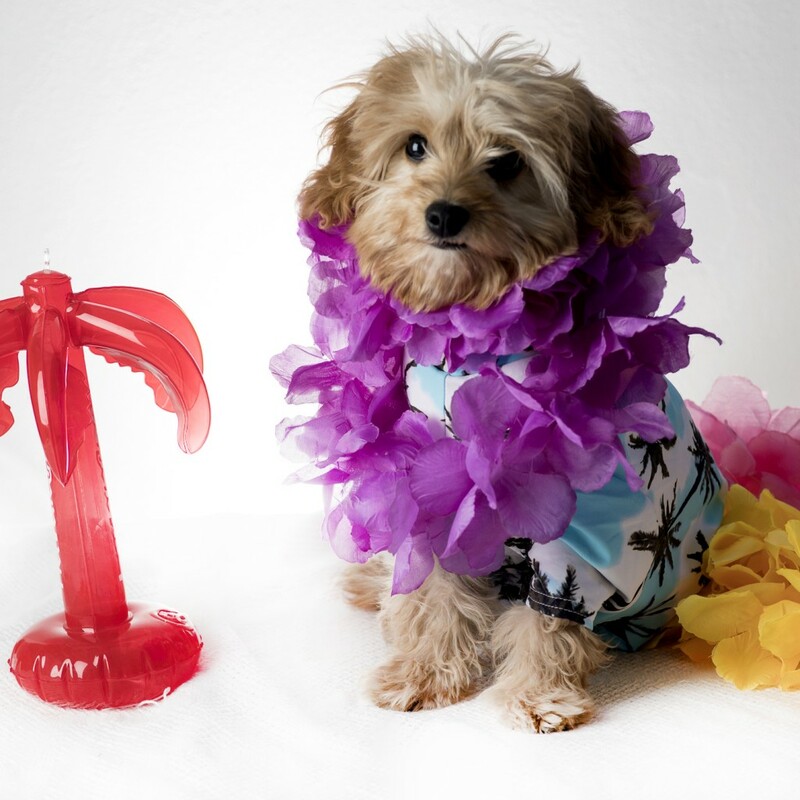 If you are a little shy at frocking up in uber-cool Hawaiian shirts then why not get your four legged friends on the case? I’d love to see pics of my friends out there striking a paws.